← trip to chattanooga + week in review. We had a good weekend – 2 kid birthday parties, church, basketball, and I stayed out late last night for a birthday girls’ night for one of my friends. It’s Monday. And boy does it feel like it. My day is packed with things like grocery store, cleaning, meal planning, cooking, working out, and a whole lot more cleaning. Anyone else? Hope you are having a good Monday, and here’s a little pick me up. 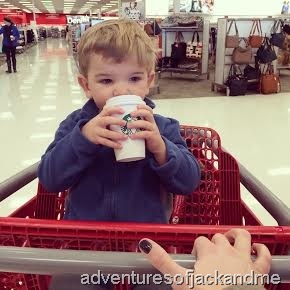 Isn’t he the cutest person you’ve ever seen drinking Starbuck? Also, I’m new to iphone world so I don’t know much. Is there a way to get pictures from my iphone to the computer and post on here that don’t look so grainy and blurry? This picture looks great on my phone but terrible on here.